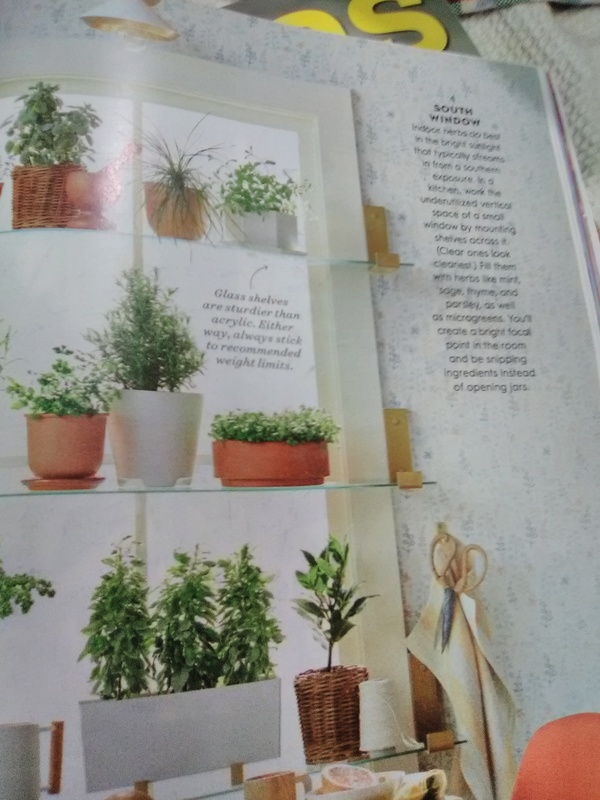 The second and third photos accompany an article about decorating with house plants. 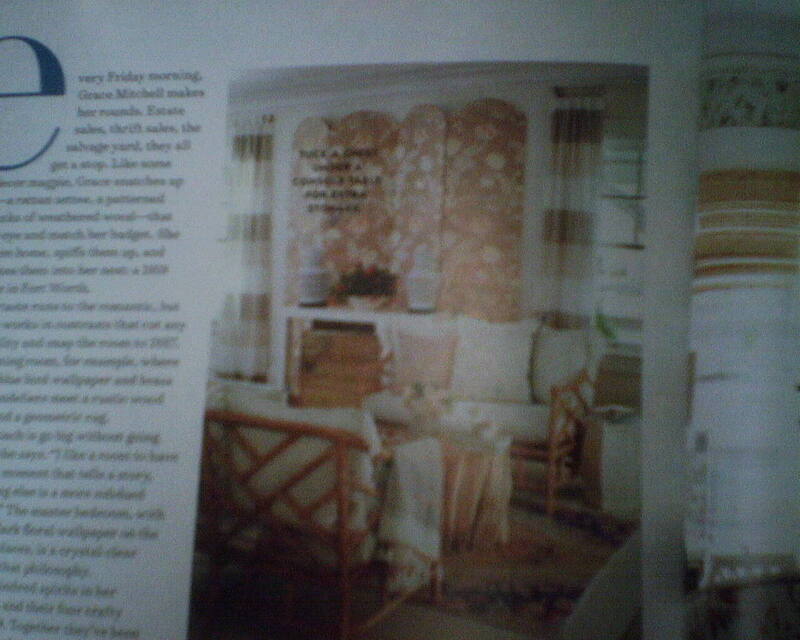 I am tickled that they chose wallpaper as a backdrop for these rooms. 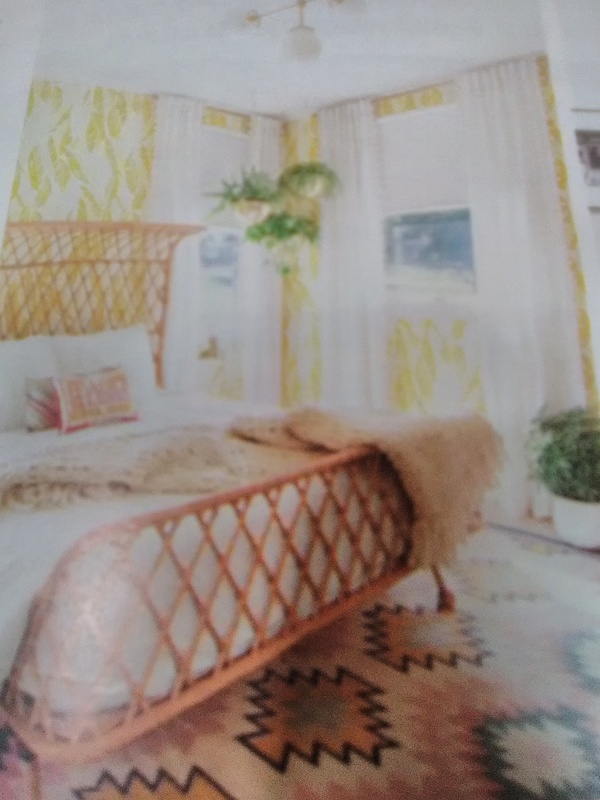 The last photo shows a bedroom papered with an abstract palm leaf pattern – which just happens to be yellow – the magazine’s feature color of the month. 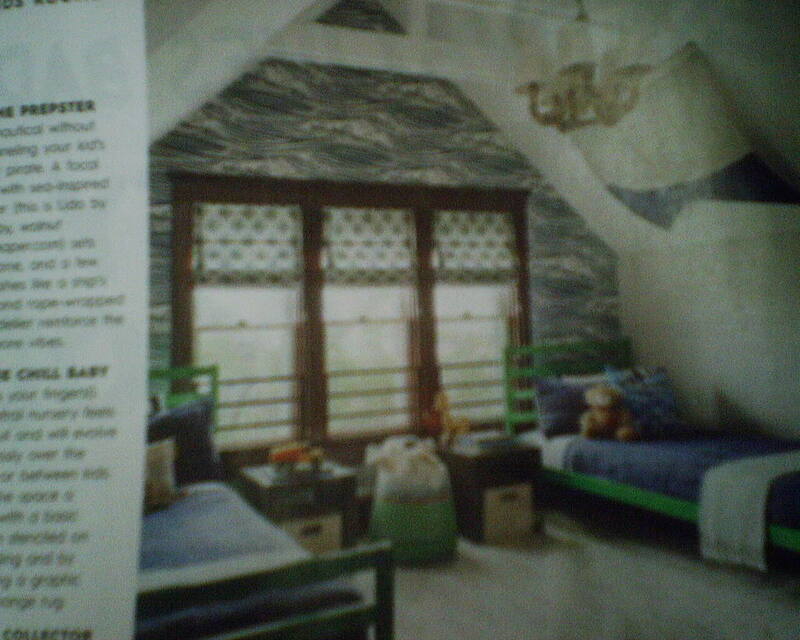 From the current issue of Better Homes & Gardens Magazine. The house featured in this article is full of fun ideas and bold color choices. This splatter wallpaper pattern fits right in! It’s in the home’s living room. No mention of the brand. 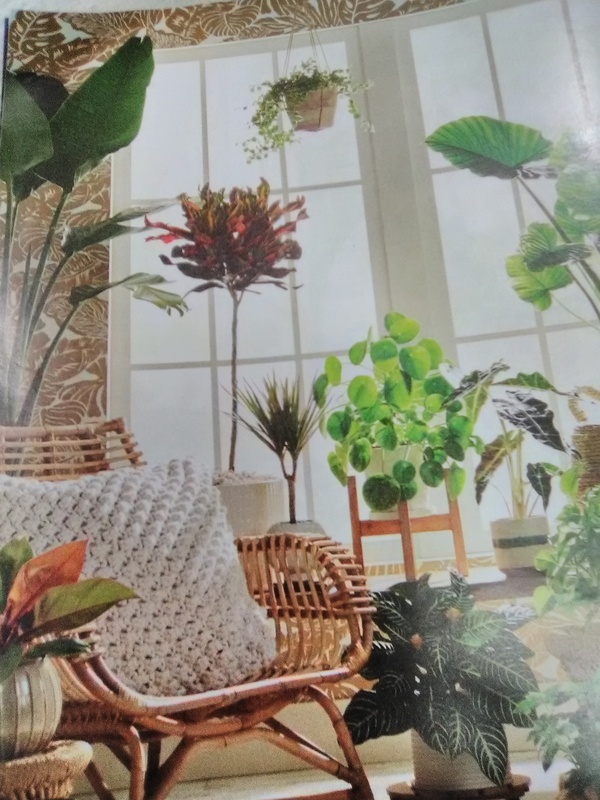 This is the December 2018 issue. 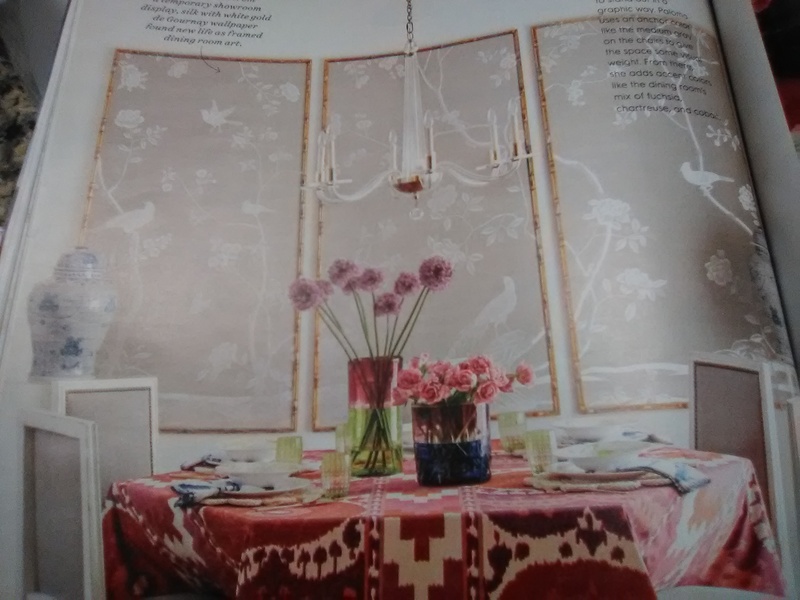 Here’s an idea from Better Homes & Gardens magazine, showing how you can use a small amount of wallpaper – one double roll or less – inside a frame, as an accent in a special area of your home. Lots of impact, not much expense, and easy to change when you are ready for a new look. And, since it’s in a frame, you can easily move it to other rooms. 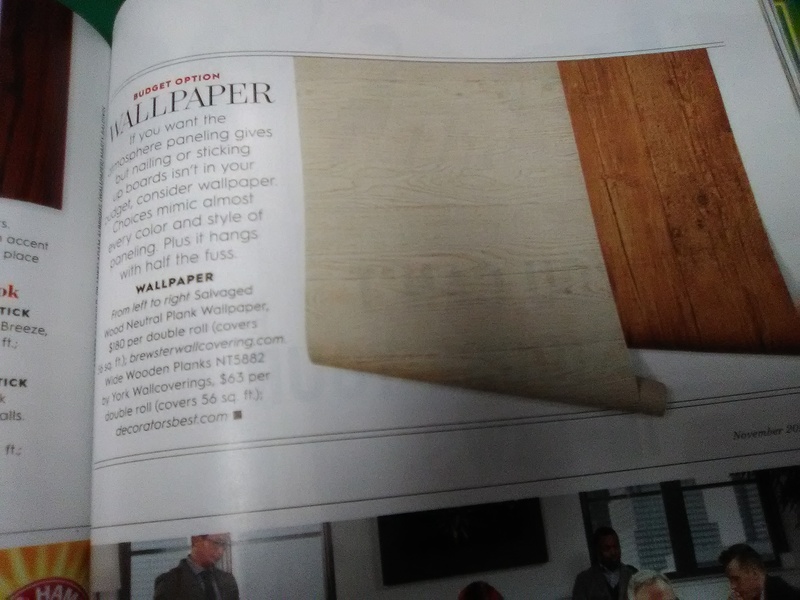 The November / Thanksgiving issue of Better Homes & Gardens Magazine shows a couple of rooms enhanced with faux wood paneling products. 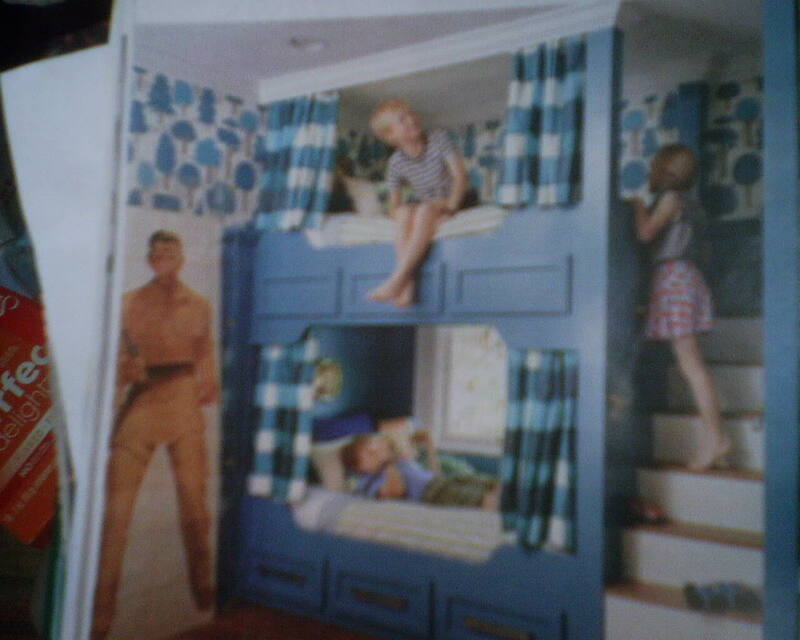 Some are three-dimensional wood planks (made of real and faux wood). 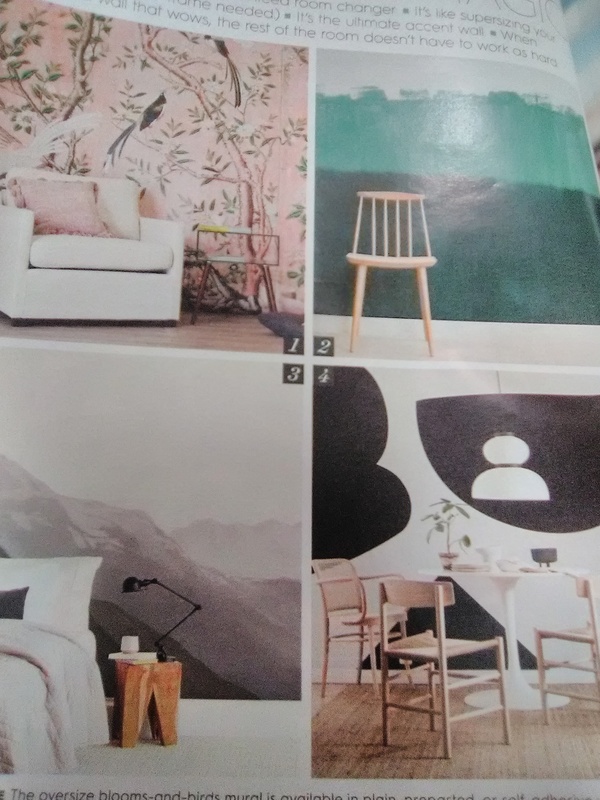 But turn the page, and BH&G shows some alternative look-alikes from the world of wallpaper. These are much more affordable, and much easier to install, options that will give the same illusion of real wood-paneled walls. The product on the left is by Brewster, a very good brand, and the selection on the right is by York, another of my favorite brands. Either of these (and many, many other options) can be purchased from Dorota at Southwestern Paint (see the page “Where to Buy Wallpaper” to the left). 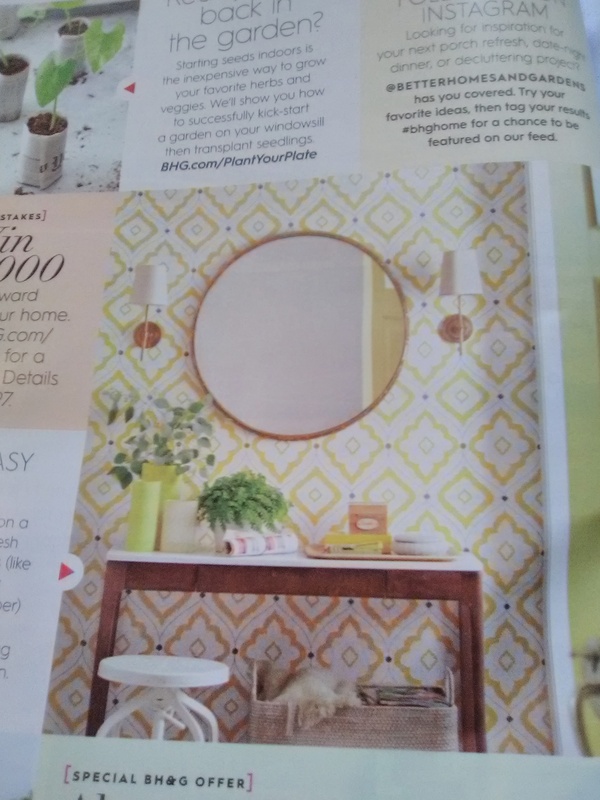 Thank you again, Better Homes & Gardens, for featuring wallpaper in your magazine. 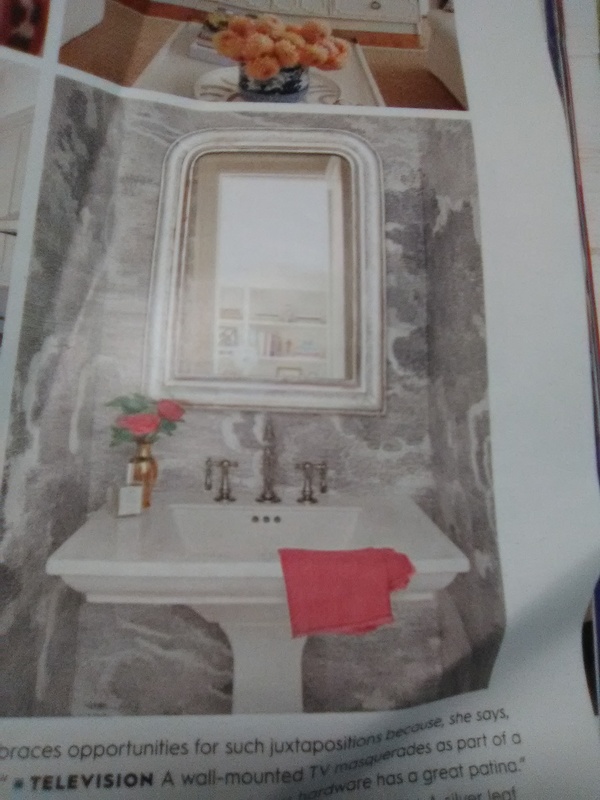 The first photo is a powder room done in “Nuvolette,” a rolling cloud pattern in the Fornasetti line by the British company Cole & Son. Next is a hand-painted scenic mural, and think the brand was Gracie, although there are a few other companies that make similar. These are very high-end products, and this homeowner saved mega bucks by having just a few panels made, and then framing them and hanging as artwork (as opposed to papering the entire room with the mural). 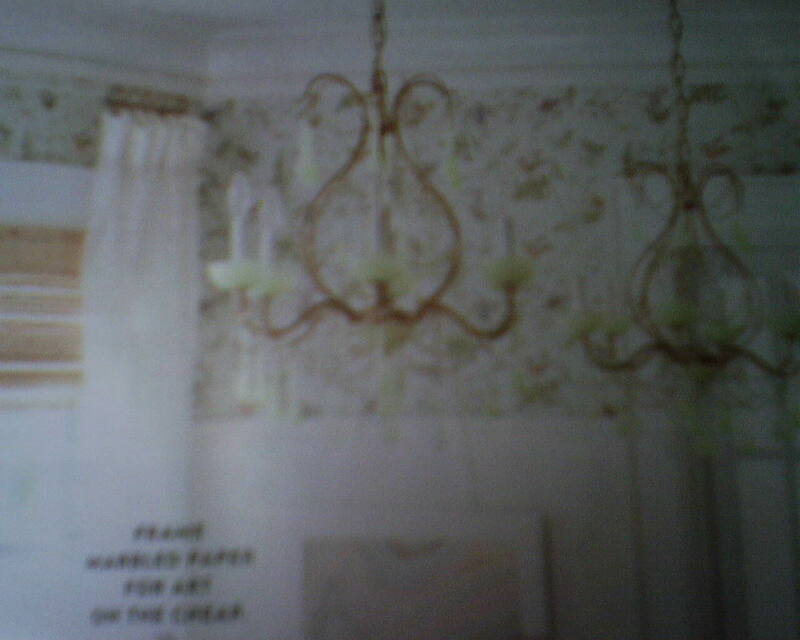 Third photo is a popular foresty pattern by Hygge & West. They have delightful designs, but I am not crazy about their papers, because the seams tend to “pouch” just a little. Do a Search here to read more (upper right corner). 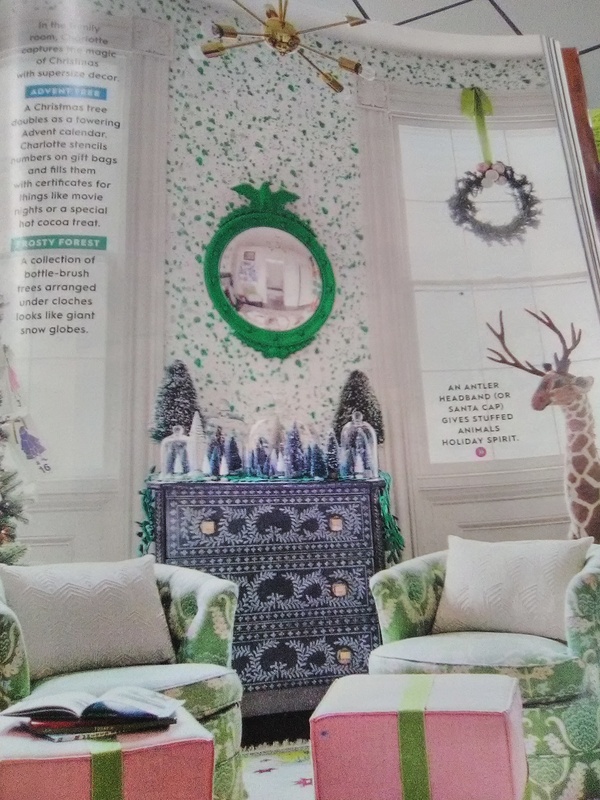 In the last photo, you see just a little wallpaper in the background. Here’s a beautiful backdrop to a sofa, an accent wall in a living room. 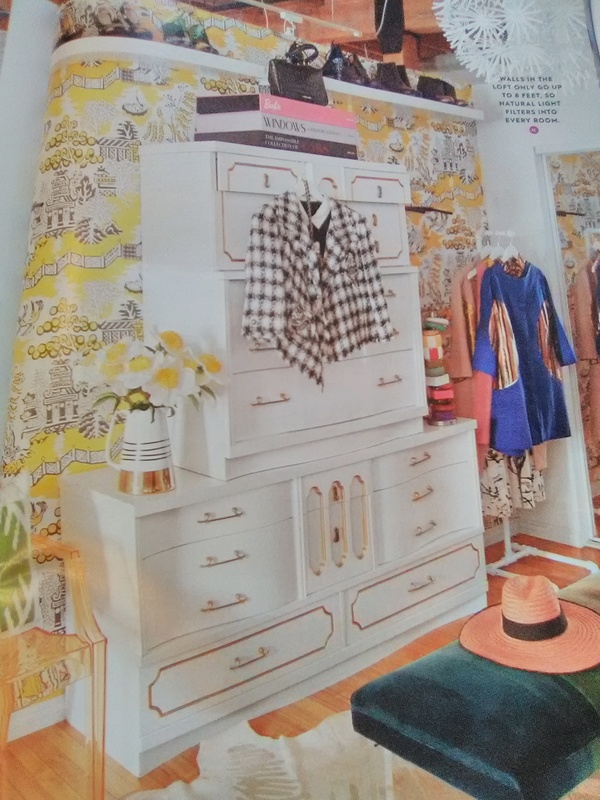 “…Mitchell Black (company) is taking the intimidation out of wallpaper, one bold pattern and easy-hang strip at a time,” says the bi-line. I’m always glad to see wall décor in public media. But I see a number of problems with the rest of their information. First, they print commercial grade (fine for its setting), traditional paper (great – as long as it’s a good substrate), and peel-and-stick (horrible). P&S paper is like putting a large and unworkable sheet of Contact Paper on your walls. Even though they call it “removable paper,” it will tear up the wall as you pull it off. It’s very difficult to get smoothed out and looking good; the article even says that you can expect it to trap air bubbles so “…save it for rooms with lots of furniture and soft light.” !! Next, they print on 24″ wide x 18′ long rolls. 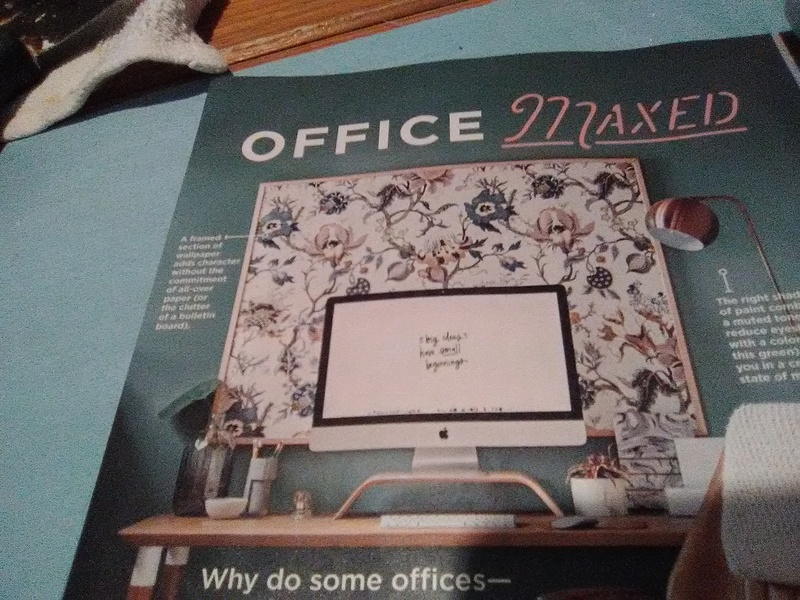 Regular wallpaper comes either 20.5″ or 27″ wide. Why print on an odd sized roll? And what’s with a measly 18′ long roll? Most papers come 33′ long or 27′ long, and generally yield three or two strips respectively. With a roll 18′ long, with 8′ high ceilings, you might get two strips (after allowing for trimming and pattern placement / matching), but with the more common 9′ ceilings, you will get only one strip). And a whole lot of paper you paid for that is going in the trash can. Last, it says, “Some pros paint first, but it’s not necessary. Just spackle holes and sand rough spots.” Wrong, wrong, WRONG! Proper wall prep counts for 60% or more of a successful job! 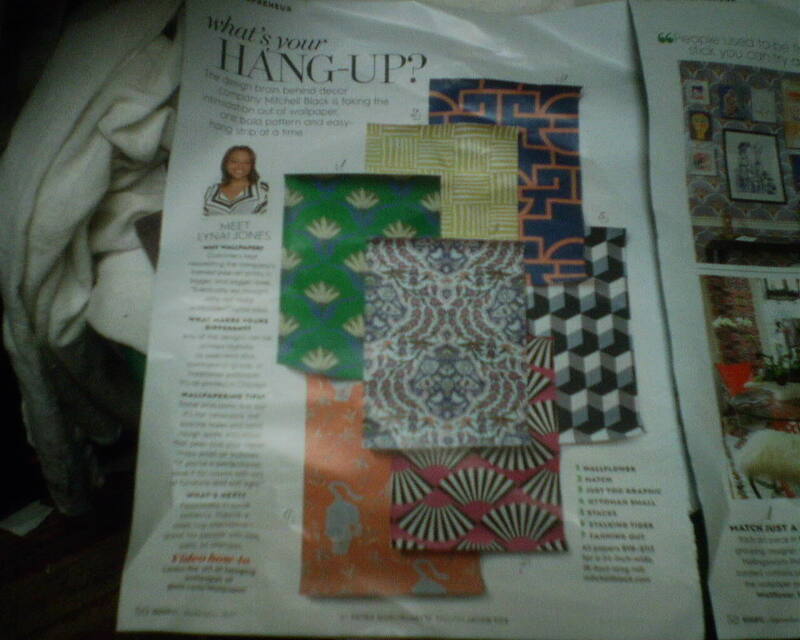 Paperhangers don’t “paint” – they prime, with a primer specifically suited for wallpaper. And merely glossing over imperfections won’t hide them … walls must be as perfectly smooth as possible. If you paper over a textured wall, the bumps will show through. If you paper over a glossy wall, the paper won’t stick. I’m not fond of their patterns, either. 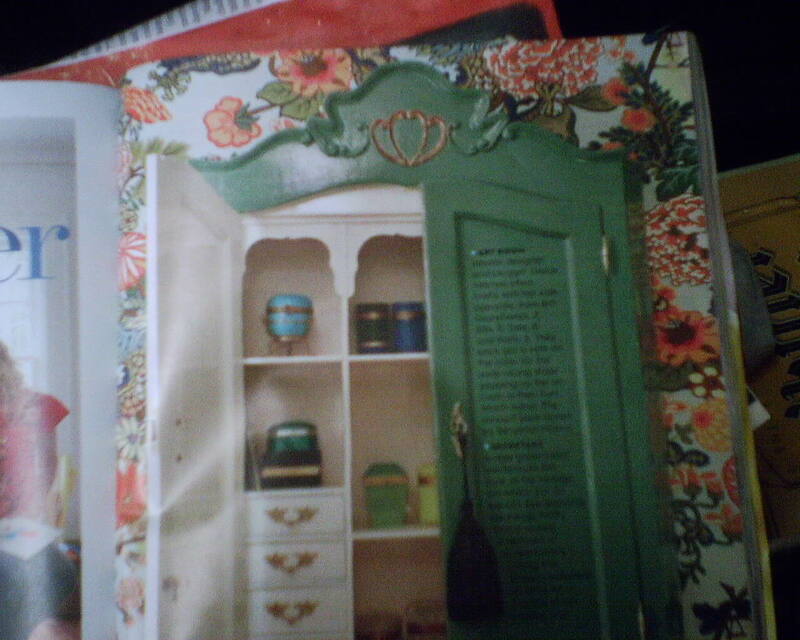 Cute designs, but three of the four photos of room sets with furniture and accessories looked awfully busy. 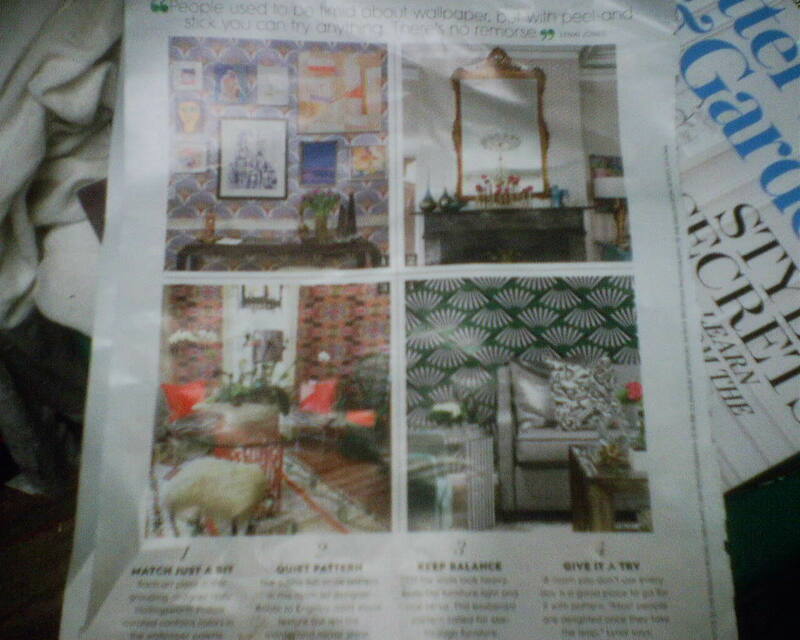 Here are several rooms featuring wallpaper in the August 2017 issue of Better Homes & Gardens magazine. 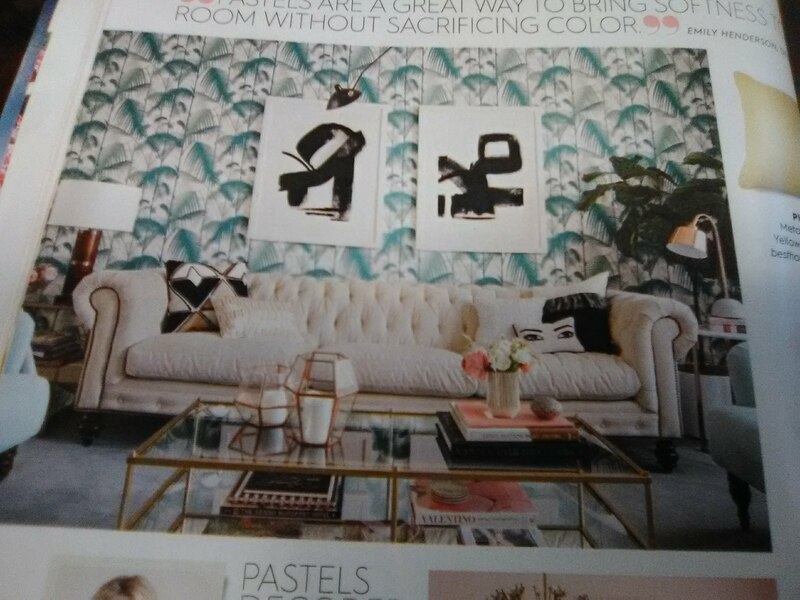 There are at least two other rooms with paper that I didn’t photograph, including a cool mural of some bright watercolory flowers clustered around the upper right corner and center top of the wall – a very effective look. As usual, please forgive my crummy photos. 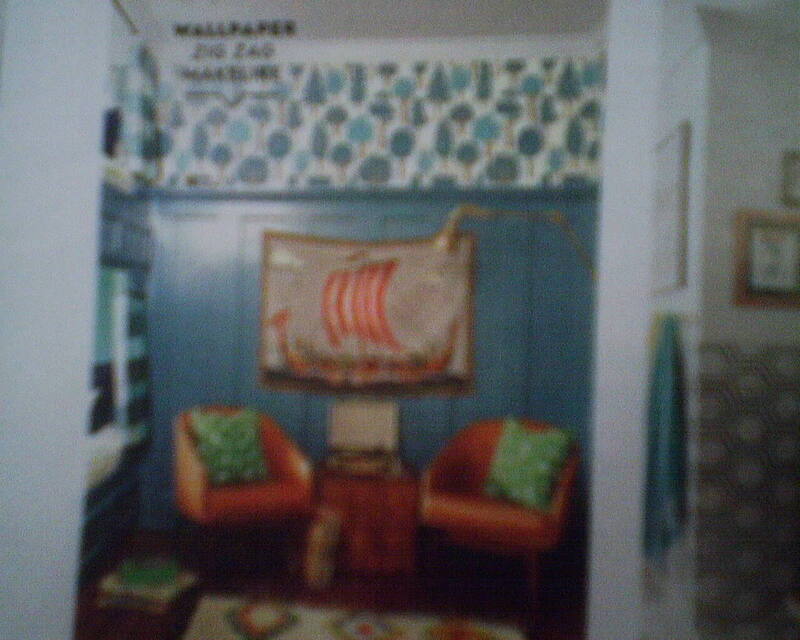 The navy blue sailing ships are by Walnut Wallpaper. 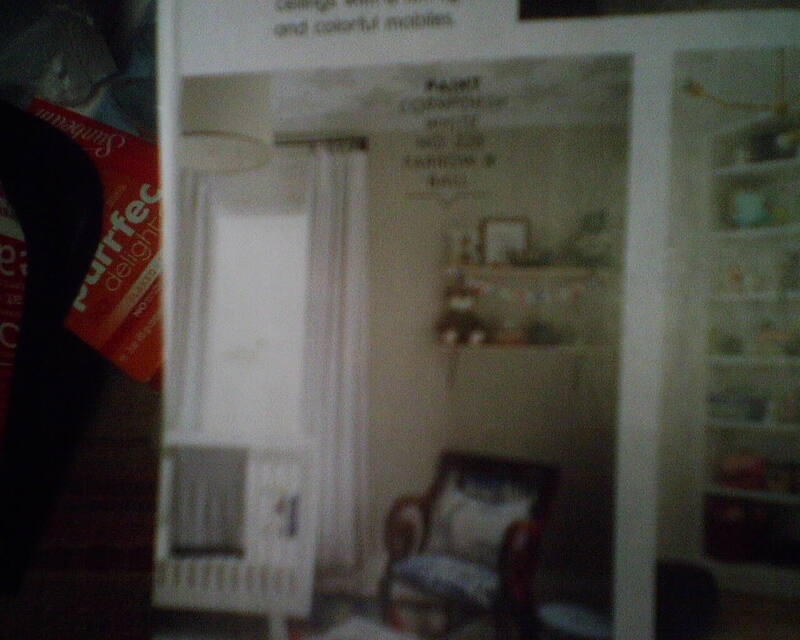 The second photo shows large stars on the ceiling of a baby’s nursery. Photos 3 & 4 are actually fabric, but they look and function as backdrops like wallpaper. Photos 5 & 6 are a classic and popular humming bird pattern by Cole & Son. I just hung this in the Houston Heights on April 9, 2017, and did it prior to that on March 24, 2016, among other times. You can look up my blog posts for those days. 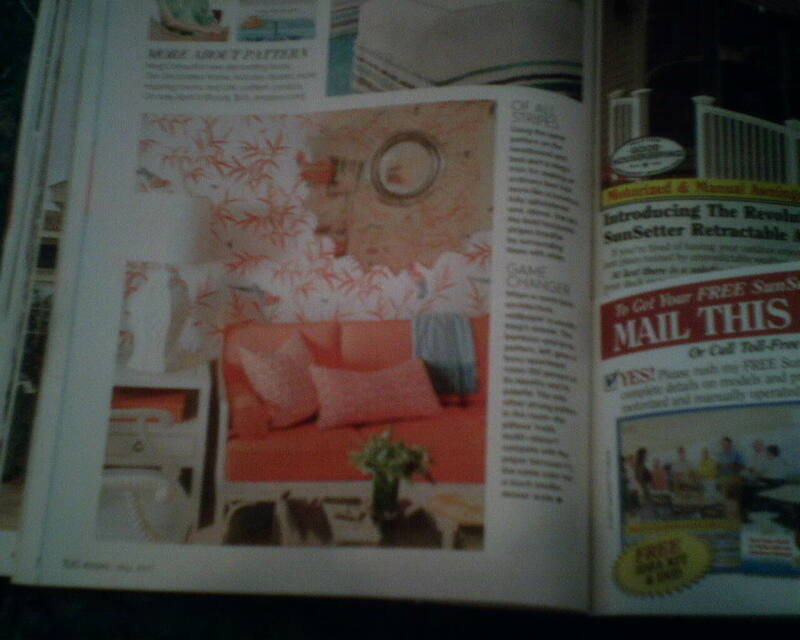 I have the same pattern and same color coming up in a bedroom in Riverside. 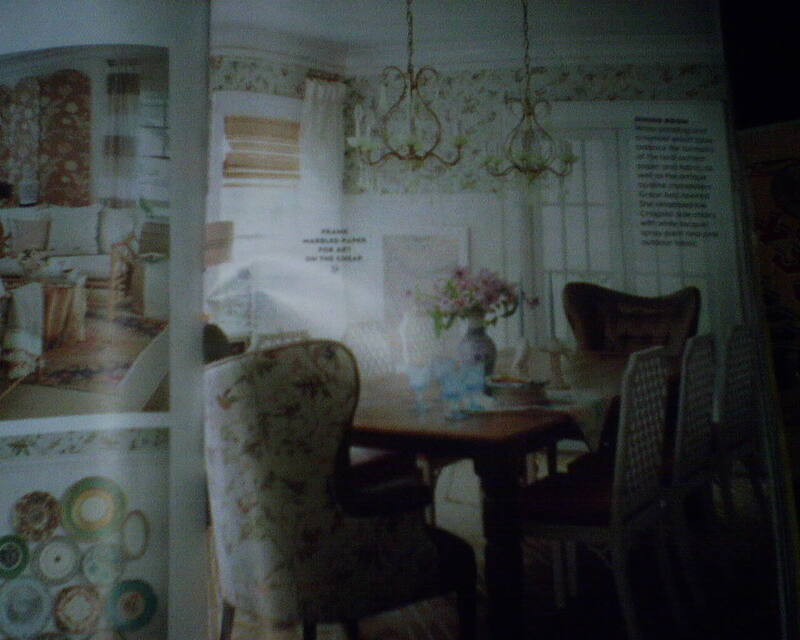 Note the matching fabric on the chairs. 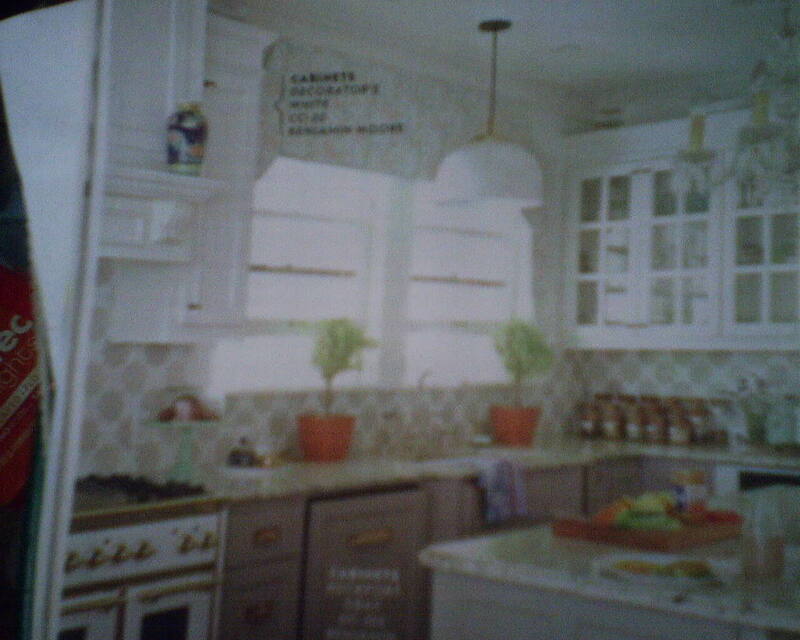 In the seventh photo the wallpaper is barely visible over the kitchen window. Photo 8 is an overscaled dramatic white on black floral that is quite popular right now. I find it a little overwhelming on the ceiling, but if you want drama, that’s a good way to get it. And you’ll have good view of it while lying in bed. Photos 9 & 10 are a fun and colorful pattern for a kids’ room. 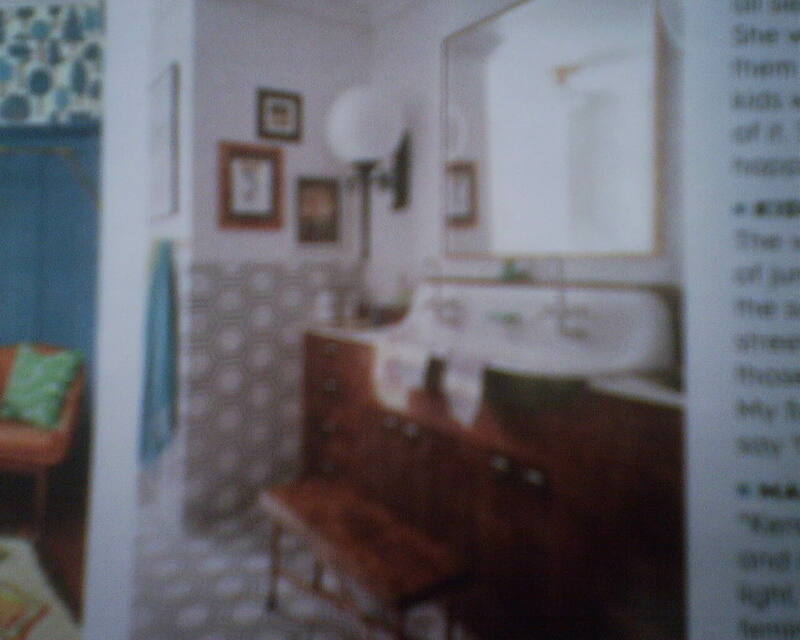 The last photo is not wallpaper, but tile, but it still shows pattern on the wall, so I’m including it here to show how it enlivens the room. 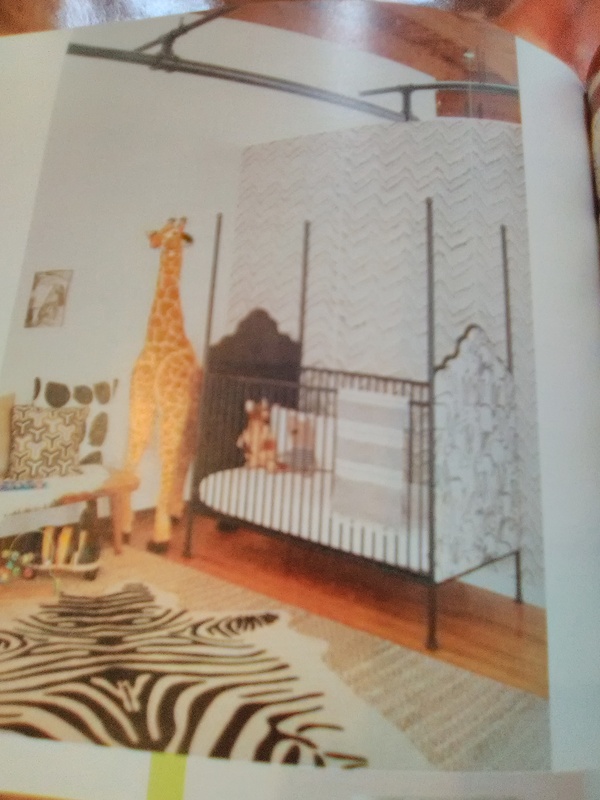 There is a hexagonal geometric pattern by Jonathan Adler that is quite similar, and very popular. 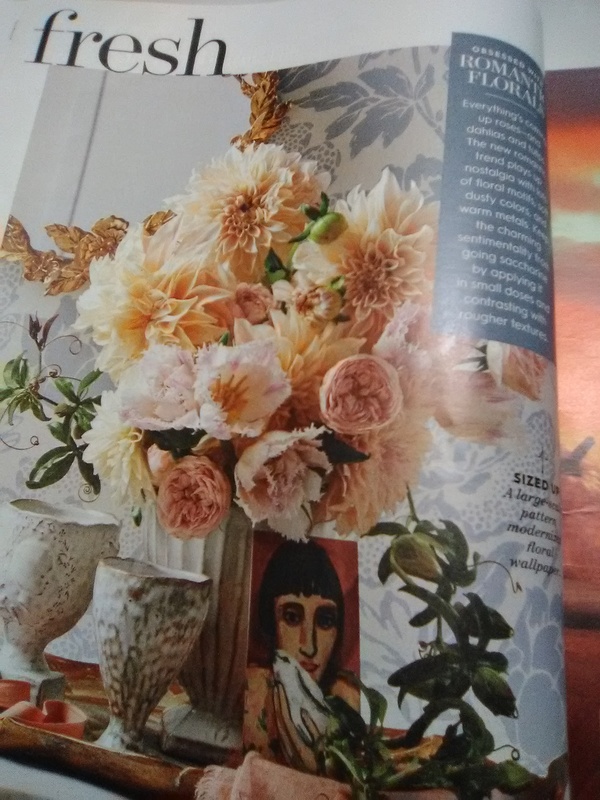 The May 2017 issue of Better Homes & Gardens magazine has a feature on the color pink. 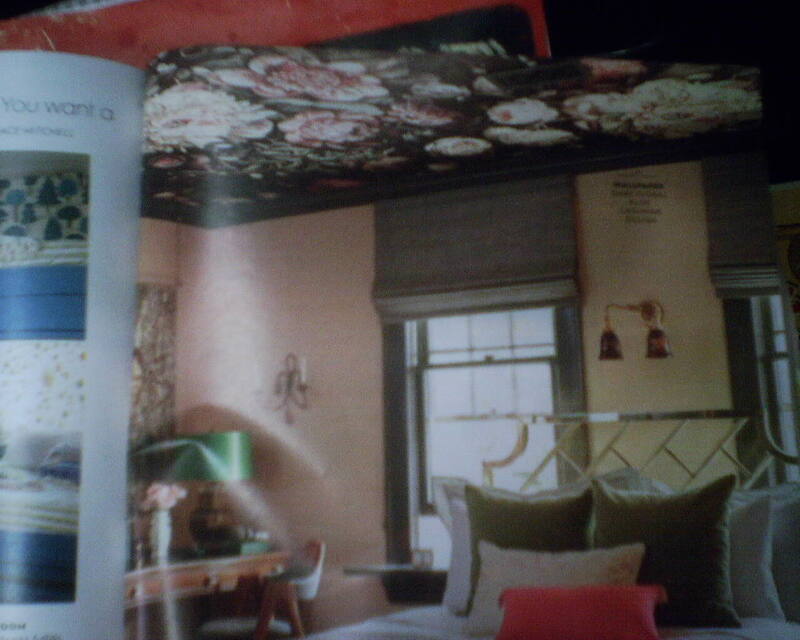 Along with paint samples, bedding, and accessories, this wallpaper was shown, as a backdrop in a living room. Pink is a pretty bold color for what’s considered a public room. But this particular treatment is not overwhelming at all. The pattern is light and airy, and the monochromatic color scheme keeps it from looking busy. 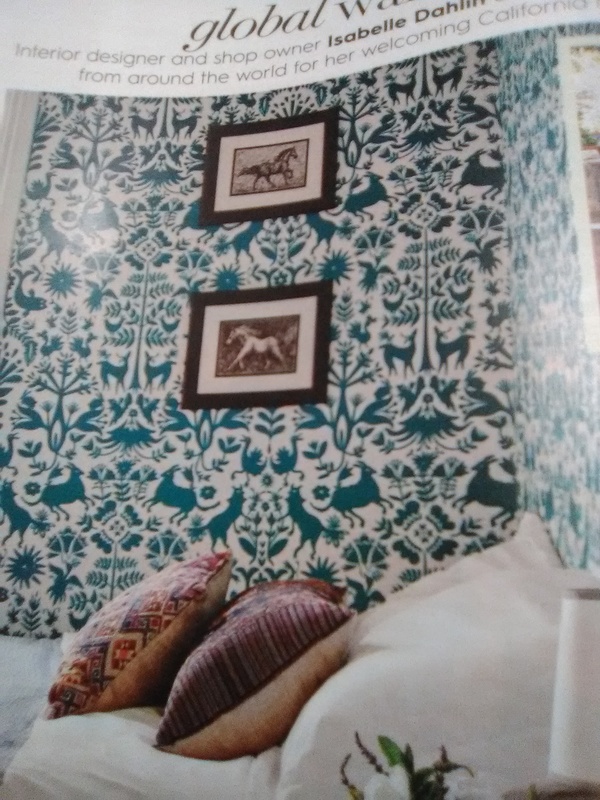 You could easily live with this wallpaper on all four walls.